Your boyfriend is like your world and he loves you like anything. He puts all the efforts to bring a beaming smile on your face and now it's your turn to make him feel delighted and loved. This Valentine's Day, make him feel special by sending Valentine gift for boyfriend online from FlowerAura. He makes you feel safe, he makes you feel love in your heart. Your boyfriend is the one who captured your heart and you didn’t even know when. He tries to take care of all your needs and is always around when you need him to be. Whether it is late night hunger pang or you are just feeling gloomy, he is always around with your favourite food in hand. Valentine's day is quickly approaching and it's time to consider the gift item that you want to give to your beloved boyfriend. When it comes to celebrating this special day, the age of your boyfriend doesn't even matter because regardless of age, every good man wants to be the boyfriend of a great woman and you are that "Great Woman" for him. Now it's time to know how to choose the best Valentine gift for boyfriend. It has been quite some years you have been together as a couple. You have loved, each and every moment you spent with each other. Every day has been bliss with your boyfriend. From the first time he confessed his love to you on the very special Valentine day, you both have fallen in love with more depth from there on. You have celebrated so many Valentine days together. After all, it is not just a day; it is the anniversary of your love life. However, this year you will not be in the city due to an official assignment. Alas! But that does not mean that you cannot celebrate the day with your loved one. In fact, since you are not in the city you can definitely make your boyfriend feel loved and cared by sending a Valentine day gift for boyfriend online. Even if you have a boyfriend who has said many numbers of times, that he does not like gifts, believe it, he will be overjoyed when he receives the epitome of your love in the form of the Valentine gifts for him online. It is a great possibility that with the gift you can actually instigate him to move a step forward in the love life. So maybe next Valentine you will celebrate as husband wife. This indeed sounds romantic. Now you might be wondering about finding a solution to send a Valentines Gift For Boyfriend. No matter where you reside at or where your loved one puts up, with the advancement of online technology, you can easily send Valentine Day Gifts For Boyfriend from the comfort of your home. If you search online, you will end up with finding hundreds of online gifts stores but you need to find the best one to send Valentine gifts for boys online. So what are you waiting for, avail one of the best gifting options from Floweraura website. 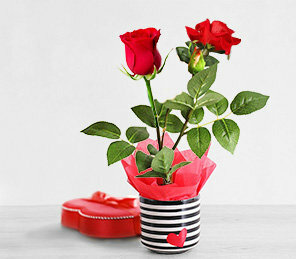 It is one of the ace Valentine flowers delivery websites with a variety of gifts for boyfriend on Valentines Day. If you love someone, show him the depth of your love with gifts. Do not wait for another day or another moment to converse your love. It is because there is no better day than today or no better moment than right now. So buy romantic valentines day gifts for boyfriend and express your love for him in the most beautiful manner. It's been almost a year you and your special someone are a couple. It is indeed a beautiful feeling to be in love. Your day starts with wishing each other Good morning and your night ends with Sweet dream messages. There is not a moment when you are not thinking about him or vice versa. Whether you both are college sweethearts or colleagues in an office or are neighbors, it does not really make any difference to your number of meetings each day. You love the feeling of being known as the couple. So, celebrate your love story this Valentine's Day and make your guy feel loved with the best Valentine gift ideas for boyfriend by FlowerAura. With the Festival of love, Valentine day, round the corner what are your plans to celebrate the special day? Alright, it is absolutely fine to let your boyfriend plan the day. But you must be having some plan to make him feel special. He is special for you. Isn't it? Just as you are his love life, so is he your love life. Hence it is apt to gift him something in accordance with his personality and choice. Whether your love has newly blossomed or your relationship has grown with age, you can always procure cute Valentines Day gifts for boyfriend from FlowerAura. You can even just send Valentine roses online from FlowerAura. If you are confused with regards to the number of options available which you can avail, you surely must click on the website of Floweraura. The best part of ordering Valentines Day gifts for boys from our store is that it allows go for free shipping across India. No matter where your boyfriend resides in India, you can simply delight him with free home delivery service of your gifts. So, enjoy a hassle-free Valentine gift for boyfriend online shopping experience with us. If you have just remembered to send online Valentine gift for boyfriend on last hours, you can still manage to send gift with the same day delivery service of FlowerAura. It is really important to know the taste of your boyfriend before purchasing a gift and at the same time, you also should know what stage of the relationship you both are standing on. Always remember one thing that your gift should be the symbol of your love and affection and at the same time the gift should be something that he will likely to cherish from the core of heart. The FlowerAura website has a plethora of gifting options that you can order or send an online Valentine gift for boyfriend. All you need to do is select one or many and then notify the address as well as the date you want your gift to reach you. It is always better to plan for the gifts in well advance so as to reach out to best option amongst the many. So have a Happy Valentine day with FlowerAura's gifts for boys on Valentines Day and enjoy each moment brimming with love, care, charm and togetherness. FlowerAura offers you a romantic range of Valentine's Day gift ideas for your boyfriend that are sure to be loved by her. So, if you are seeking for a unique and yet romantic Valentine gift for your boyfriend with Valentine card. And, if you are looking for homemade Valentines Day gifts for boyfriend then, we have some delicious homemade chocolates that are sure to please his taste buds. My Adorable Boyfriend' which consists of a 'Love You So Much Card', a pack of 5 delicious handmade chocolates in heart shape and a cool Coffee Mug, especially designed for him. Unforgettable Love' which consists of one plush 15 inch soft toy puppy, one heart cushion and a LOVE card that speaks about your deepest emotions. Love For You' which consists of A 6 inches cuddly bear saying "I Love You" - A 12x12 inches digitally printed "I Love You" Cushion. Keep Calm My Love' which consists of one Love You Lots card, two champagne bottles filled with chocolates and one digitally designed Coffee Mug. Do Valentine Gifts Really Matter for Guys? Why shouldn’t it matter? A perfect Valentine’s gift that comes with the creative thought definitely matter a lot for the guys. According to the behavioral studies conducted in the US, most of the guys prefer to have gifts with emotional values over gifts with the materialistic value. What is best Valentine Gift for College Boyfriend? College life is the life full of fun and that too in the expensive ways. Therefore, giving a Valentine’s gift that your boyfriend can use on a regular basis would be the best idea. Best Valentine Gift for Romantic Boyfriend? The answer is pretty straightforward here- all he wants your presence that follows a cozy time after. He is always on the side of gifts that come with a great emotional value and reflects romance. Nothing can be a better gift for him than your loving presence on this Valentine’s Day. Your boyfriend is the one who is always by your side, through ups and downs. He understand your mood quite well. He knows what you need and when. Your boyfriend is always there with a good advice to help through difficult situations. You feel lucky to have found him, show him too.